To write, I need uninterrupted time. Time to think. Time to imagine. Time for introspection to bring forth the thoughts and emotions that will fill the written page. My mind enters a state of flow and the story unfolds and streams into existence. Interruptions intrude into my day and break the flow preventing the story from streaming forth. Frustration and anger at the interruptions and their sources are the result. Even with the distractions, I write. In these circumstances, I will write a paragraph, or sometimes only a sentence, but I will write. Thought out, planned, and outlined, I know where the story is going and what happens next at any particular point. This allows me to write the next few words even if I don’t have time to issue forth the next hundreds or thousands of words. Another task I perform in these moments is editing. I return to words already written and tweak them striving to improve the writing and to enhance my skills so I will write better the next time. One of my editing steps is to search for occurrences of words from my list of problem words. This leads me to places in the prose where I can improve sentence structure and conciseness. 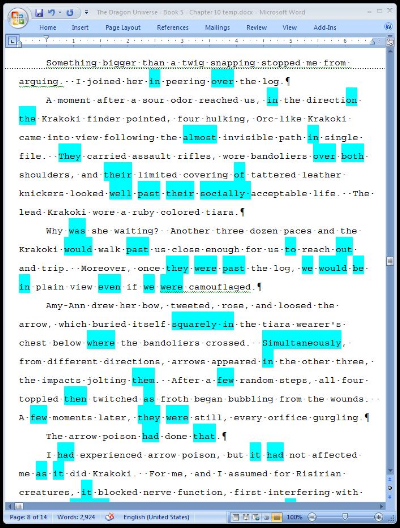 In the past, I searched the document by doing a find on each word one word at a time. That was slow and tedious. To enhance the process, I created a Word macro that highlights the words from my list and words ending with ly. Creating the macro was fun, but interrupted my writing time. A future enhancement to my macro will highlight with different colors the words from my list, and the ly words, based on why the words are on the list. Doing that enhancement will again interrupt my writing time. It seems I cannot escape interruptions. Words highlighted by editing macro.